Similar to 37 Things You Can Do To Improve Your Skin’s Appearance, here are 27 things you can do to improve your hair and keep it from shedding too rapidly or breaking off. The Goal: Keep your hair on your head. Not including the obvious elimination of chemical treatments, this comprehensive list contains all you need to maintain a healthy head of hair. They are categorized by care/maintenance and styling. You don’t have to do them all at once but it’s a good idea to make a habit of a few for several months and see how your hair is coming along. Then, you can work through the list and try one of more of the others. Nix shampoos with sulfates. It doesn’t matter if you hair is natural or relaxed. 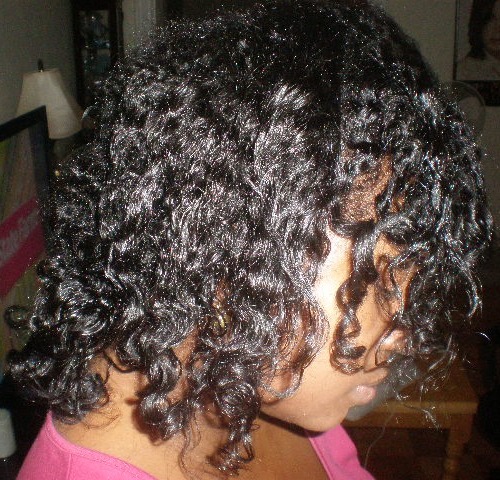 Sulfates strip the hair of needed moisture and oil. Pre-poo (pre-shampoo) your hair with coconut oil or olive oil. Coconut oil helps hair retain it’s moisture. 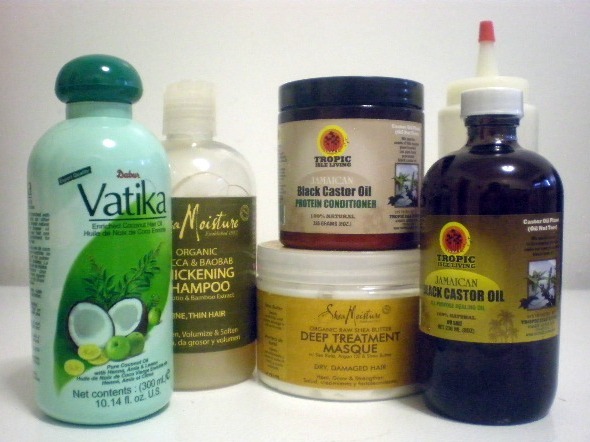 Both natural oils protect the hair from being stripped when you shampoo. Deep condition your hair with a moisturizing deep conditioner after every wash.
Get a protein treatment.For maintenance, you can do this once a month or more if your hair is breaking. Massage your scalp to stimulate your hair follicles 2-3 times a week. Some believe this encourages hair growth. I have not found it to be so one way or another but it certainly can’t help and it does increase the blood flow to your scalp. Comb hair from the bottom up. When your hair is soaking with conditioner, you can comb it with a large tooth comb or Denman brush to detangle. Do so carefully, working from the bottom up. Next PostWeave Wearers: Is The Tami Roman Line for You? who is the woman in your photo,is that you Michelle? Or is that someone else? Her hair is very beautiful,do you have any more pics of her hair? These are such great tips! I am definitely bookmarking this post and taking notes. I’m already putting into practice the sealing of the ends with JBCO and seeing results as you suggested. My ends don’t look as scraggly as they did a few short weeks ago. I’m making a note to refrigerate my leave-in conditioner too. I’ve never tried henna, but I’m always so intrigued by it when I hear you talk about it. On to read more about it! Thanks for sharing these tips Michelle, my beautiful beauty guru friend! Thanks for the wonderful advice. Be blessed always! For my pre-poo, I love Ojon Restorative Hair Treatment. I don’t drink coffee but it smells like coffee and I love how my hair feels afterwards. My grandfather was a barber and he always told me that if I want my hair to grow, I have to massage my scalp. It does work but you have to massage more than two or three times a week. I have a section of my hair that was much shorter than the rest of my hair. I didn’t want to cut the rest of my hair to make it even so I decided to make that area grow. I’ve been massaging it and adding Carol’s Daughter Healthy Hair Butter to that section and it has grown trememdously. I try to massage daily but sometimes I forget. Still, I massage several times weekly and the growth is really wonderful. Great Tips Michelle! I’m so glad I came over here to your blog, you have TONS of beauty tips I could use! Thanks Viv! Please do stop by. I share hair and skin stuff on a regular! These are some great tips, the only thing that confuses me is where you say never comb or brush dry hair to style. I remember reading somewhere that you are not supposed to comb or brush wet hair. So I’m a little confused and I just want to be sure that I’m doing the right thing with my hair so could you please explain a little. I’ve seen the same thing. I was so confused before too. But think about it. Naturally hair is curly. Running any kind of comb or brush through your hair will cause it to snag up and break. If you soak your hair with conditioner, the comb (or denman brush) will slide right through causing little to no damage. Now, combing wet hair that is NOT soaked in conditioner IS a recipe for disaster. It’s the slip of the conditioner that allows the comb to glide ride through your hair. A few months back I was combing my hair dry. It was moisturized and everything. I couldn’t for the life of me figure out why on earth I heard that snapping sound. It was breaking! I even combed it from the bottom up but still. Our curly hair can’t take it. People with straight hair can comb dry hair but for us, the most gentle way to do your hair is to finger comb when dry and comb (or denman) comb when soaked with conditioner. Thanks Michelle, this helps a lot. I now understand what I was doing wrong and what I have to do from now on. Cool. I didn’t figure this one out until just recently…like 3 months ago.